Learn about the different types of solar lights and their distinct features to help you pick out the best way to illuminate the area around your home and garden using solar energy. Solar lights use solar cells which converts sunlight into electricity. The first photovoltaic cell was developed in 1839 when French scientist Edmond Becquerel recognized the potential of harnessing solar energy for generating electricity. He and his French compatriot Augustin Mouchet proceeded to create the first solar-powered generators in the 1860s which were able to power small light bulbs. In 1883, American inventor Charles Fritts invented the first solar cell that had only about one percent electrical efficiency. 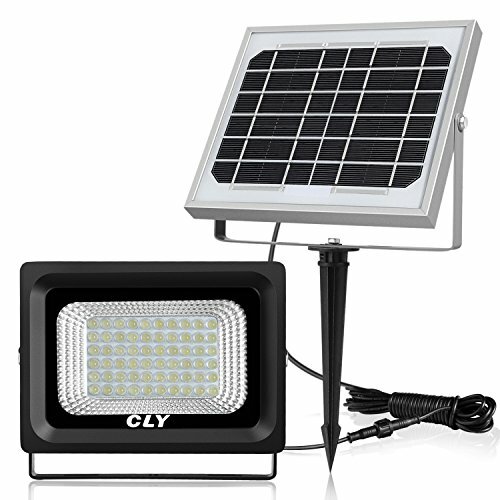 Nowadays, solar lights are wireless and can be used inside or outside the house. They can be installed in a snap and relied on even during cloudy days. LED Lights, in particular, can last for 50,000-200,000 hours and a lifespan of more than 20 years. Maintenance is practically free since they only require a battery change every 5-7 years. While solar lights can be used to illuminate space in your yard or garden to allow you to easily see, they can also be used simply for decorative purposes. There are many different decorative solar lights that you can choose from, depending on the style that you are interested in. When opting for decorative solar lights, it’s important to remember that you will want to consider other lighting alternatives and allow these to simply be an attractive addition to the yard. Many of them tend to glow rather than be very bright, which is why they are great to add interest to your yard, but probably won’t provide you with a ton of light. One of the most popular types of solar lights that you can buy is path lights. These solar lights are generally very small, and you will want a large number of them so that you can line them up along the path to your home. When they are placed in an area where they will get a lot of sun during the day, they make it very easy to illuminate the path so that visitors and members of your family will be able to easily make it to your home. These lights generally come on stakes, with hanging hooks, or with flange mounts, which makes it easy to position them where you want them. They generally direct their light down towards the ground, which makes it easy to see where you are going to be walking. One reason people opt for solar lights that are hidden inside of rocks is that they do not want their solar light to be incredibly obvious. If you want to include solar lighting around your home, but you aren’t interested in the lights taking away from the beauty of your landscaping, then using solar lights that are inside of rocks is an excellent choice. You can generally include these in your landscaping without it being obvious that there is a light in them, which makes it easy to get the illumination that you want and need without sacrificing the way that your yard looks. Make sure that you position them so that the light will shine where needed, but that the solar panel won’t be so obvious, for the best use of these lights. These solar lights come in two different varieties. The first completely eliminates the need for using path lights, as you will be able to place these flat steps on the ground, and the light in the middle will shine upwards to make it easy to see where you are walking. The second type of step light is bent at a 90-degree angle so that it can be installed over the edge of steps leading up to your porch or your deck. The type that you choose will depend on whether or not you want to make a path through your yard and desire flat step lights that can be stepped on, or if you want to install lighting up the stairs so that nobody trips coming to visit you. This is a very popular type of solar lighting, and it is one that is used to really improve the appearance of your home, draw attention to your architecture, and improve the safety of your house. These wall lights can generally be installed on an exterior wall of your home and will provide you with a nice light when the sun goes down. You do have to consider where the sun will be in relation to your lights so that you can make sure that your lamp will be bright enough during the night. Some wall solar lights look exactly like traditional electric lights, but they are a wonderful way to save money on your power bills each month, which is why homeowners opt for them. Floodlighting is used to illuminate a very large space outside and generally requires a lot of electricity due to the power and size of the bulbs. They are permanently installed, unlike other types of lights that can be moved and adjusted, and they are used to help improve the safety of a location after dark or accentuate the architecture of a building. When you opt for solar lights for your floodlights, you will generally have a large solar panel above the light itself to ensure that your flood light will be bright enough to shine all night long. It can be difficult to attractively light up your deck for nighttime use if you don’t have the right lights for the job. For that reason, if you are lucky enough to have a deck with a railing, you will want to make sure that you buy deck lights that can fit along the edging or deck rails. These lights will provide you with plenty of light so that you can easily see where you are walking on your deck without being at risk of running into something or falling off. When used in large enough numbers, these lights will do a great job of providing you with all of the light that you need to see where you are and where you are going. However, to be able to see finer details when it is dark out, you may want to opt for other solar light options, such as wall lights, as well. You can make sure that everyone who visits your home at night knows your address and exactly where they are when you opt to address solar lights. These fun lights will light up in the shape of your street number, making it easy for guests to find your home even after dusk. Because they can be installed in most locations, such as on a fence, gate, or tree, you can easily customize the look of your lighting – as long as there is enough light during the day to make them illuminate at night. Lamppost solar lights are incredibly popular, as homeowners realize that they are a great way to enjoy the look of a traditional lamp post in their yard without having to worry about running electricity to it. They come in a variety of styles and sizes, and as long as you install it securely and correctly to your post, you don’t have to worry about the solar light being damaged. When looking for a lamp post light, make sure to take into consideration the style and appearance of your home, as these lamps come in a number of options. You can easily choose ones that are more modern or more classic in design, depending on the style that you want. Twinkle, or string, lights have always been popular in the backyard and are a fun way to illuminate an area and add a touch of whimsy to space. While they do not provide enough strong light to be used as the primary light source when you are outside, they are a great option for creating a nice ambiance. When you opt for string lights, you will enjoy that you can easily move them from one area to another as your needs change, as they do not need to be installed the way that other types of solar lights do. They can easily be rolled up and stored away when not in use and hung from trees, fences, porch railings, or the roof when you want to set the mood for a party. Ponds can be incredibly beautiful at night, especially when they are lit up from inside. If you are lucky enough to have a pond at your home and want to illuminate it, either because you are worried about someone falling in or because you want to draw attention to it, then you need to choose the right solar lights for the job. Submersible solar lights are a wonderful option if you want to be able to light your pond from within, but you don’t want to have to worry about how you are going to manage the electricity to your new lights. This type of outdoor lighting has short units that are mounted on the ground and have a light that will emit from either the top or the sides. They are used to illuminate pathways, steps, or walkways and can be used in place of path lighting if so desired. Because they come in a number of styles, it’s generally easy to find ones that will fit with the overall aesthetic of your home and yard. There are more elegant options that are made of sleek metal, as well as ones that are formed from concrete. No matter whether you choose a bollard light that is only a few inches tall or one that is more than two feet, you can easily find a bollard light that will provide you with the light you need. Spotlights are incredibly bright and are used to focus the light that they produce on a certain area in your yard or on your home. They are generally designed so that you can easily mount them in a number of ways, and you don’t need to worry about how you will be able to angle the light to hit your home. 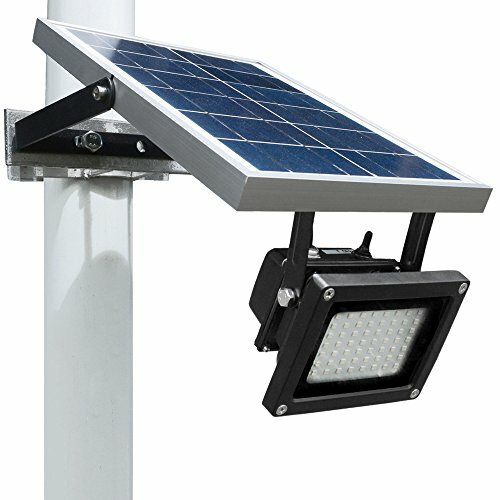 Often you can find solar spotlights that have a solar panel that will be mounted in a different location from the spotlight itself. This allows you to place the solar panel in an area where it will get the most sun while you can still place the spotlight itself where you need the light. These are generally very durable lights that are designed to last for a long time and to stand up to extreme weather without any problems. Mason jars are everywhere, and you can now buy solar lights that are built into the lid of these jars. 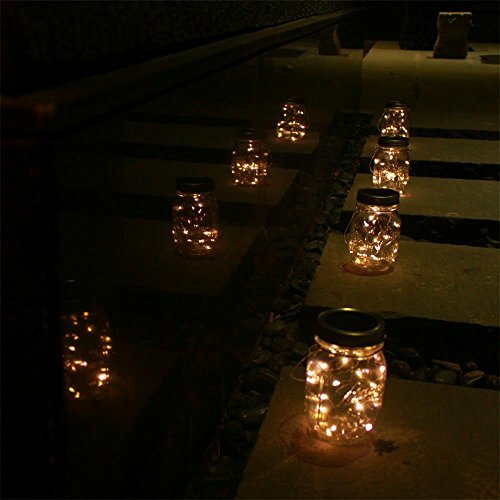 This allows you to hang up mason jars filled with solar lights around your home, along with the roof, and in trees for a magical environment when you are having a party. These lid lights are beneficial because you can easily charge the solar panel in the bright sun during the day and then move the light to a location that wouldn’t have received as much light later. 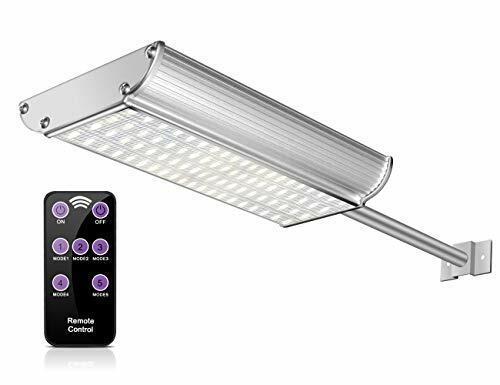 While many solar lights will automatically turn on when it gets dark and then turn off again in the morning, there are some that will allow you to have a little more control over the light that they produce. Solar lights that have a dual function mode allow you to choose between low lighting for a long time or bright lighting for a shorter time. This flexibility makes it easy to provide the lighting that you need, even if your needs change. For the most control over your solar lights and the ability to easily turn them on and off and to cycle through different modes, you will want to consider a solar light that comes with a remote control. The remote makes controlling exactly how much light your solar light produces and when it turns off simple. Unlike other solar lights that are only on/off, you will love the control that you enjoy with this light and the fact that you can so easily operate the light with the help of a handy remote. Perfect for when you are going to go camping or to have on hand in an emergency, portable solar lights allow you to take the light that you need with you. They are small enough that you can easily pack them in a bag for a trip. 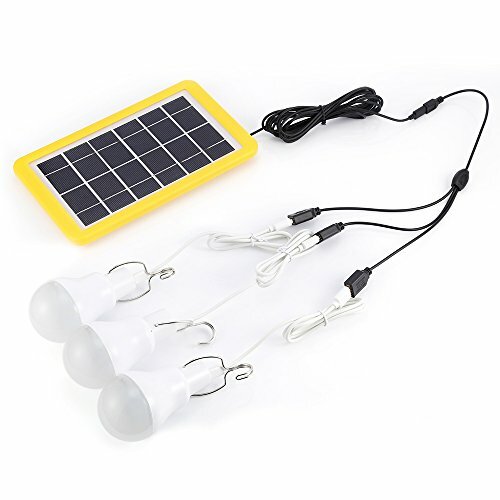 Look for a portable solar light that allows you to plug in multiple LED bulbs so that you can get the light that you need without any problems. Some portable solar lights also can be charged by USB before you leave the home, which will give you even more control and ensure that you have the light that you need when camping or when faced with an emergency.